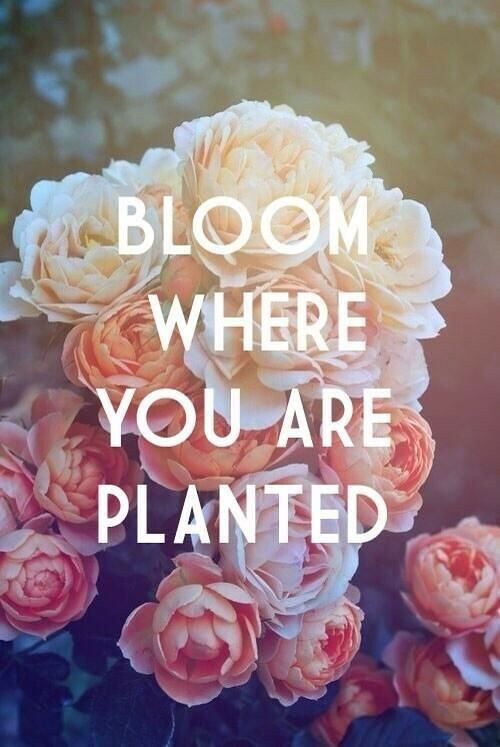 This whole idea of “blooming where I’m planted” seemed to resonate with many of you. Obviously, I didn’t invent this amazing concept or phrase. Yet, I’ve slowly made it mine, at least in my own definition of its meaning. It’s my new mantra as I guide my life in a new, exciting direction. Sometimes all we need are a few words to spark something, to find motivation. Truth: We can’t all live the lives we imagine in our heads. It’s just not possible. Yet, I’m sure most of us have hopes and dreams that aren’t already realized. And maybe, for whatever reason, they won’t be for years to come. So, it’s a good exercise for our sanity’s sake to grasp onto whatever parts of whatever it is while living our current existence. But how can you do it? Well, I have a few suggestions. These aren’t expert tips, mind you. Instead, they’re things I’ve been trying in my own life that I thought were worth sharing. I’ve always had trouble with being a more negative person, and I can be bad at covering it up. Thing is, keeping my mind down in the dumps wasn’t getting me anywhere. I was stagnant. I’d complain or worry or whatever else, and I’d go absolutely nowhere. Then I started to look at life form another perspective. It certainly wasn’t natural at first, in fact -- it took some, well, forcing. Slowly, instead of looking at everything around me as “the stuff I’m stuck with” or “things I want to escape” -- I found beauty and opportunity with what I already have. It’s an ongoing battle in my brain, but it’s one worth starting if you tend to be more glass half empty like me. Negativity closes a lot of doors before they have the chance to even open. With this emerging mindset, I’ve been able to look around within the community -- at the people, places, and things -- in an entirely new way. Instead of getting all upset and retreating into myself on, say, a gloomy weekend in the suburbs (with an eye-roll because I was growing so annoyed with strip mall window shopping as our main go-to activity), I sought out the kinds of people and activities that fill me up. Maybe I couldn’t live the exact life I imagined in my head, but I could surely find the best life that’s available to me where we’re currently rooted. Saying yes to new activities and invitations led to even more new activities and invitations -- and stuff that I didn’t even know was going on in our area. It was like I unlocked something inside myself that literally unlocked the world around me. I’ve made a list of the things I want in my life that I don’t think I can have in my current digs. And I use “digs” loosely to mean location, stage of life, income, etc. For me, a lot of this stuff has revolved around being more closely connected with the natural world, taking charge of our resources and household happenings (homesteading), and making more meaningful relationships with people who live in our immediate area. Along with a short bucket list of sorts. Of course, my list is much more specific, but those are the broad categories. If you want to try this exercise, make your list short, specific, and somewhat attainable. But add a shoot-the-moon type item on there, too. I’ll get to that in a minute. It sounds silly, but I've used Pinterest to aid my journey. I’m a visual person and very much research oriented. So, along with reading books that fuel my interests, I like making inspiration boards with links, photos, and etc. for anything and everything I’m interested in learning + achieving + seeing as part of my life. This way, I have this digital resource I can consult when I have a free moment -- however short and fleeting. It also provides a sort of escape into my happy place if I’m feeling frustrated. I have a private board for those activities I’ve completed or have more personal attachment to. I keep copious notes here, too. I’m guilty of being a big time waster. I like watching TV or reading online or otherwise procrastinating. I took a week to track how much time I was spending on mindless and nonproductive things, and it astounded me. I’ve taken measures to be more disconnected from notorious time-wasters like Instagram, Facebook, and apps. Especially anything that pull me into that whole culture of comparison frame of mind. And I’m working on finding a better balance between being SUPER productive/working on all my freelance stuff and laying in front of the TV in a tired heap. I know I do a lot of stuff, so I need some leisure time, but I could do a lot more reading or enrich my life in other ways (I used to knit/sew/craft more, I used to read more books, I used to volunteer) besides just idling there under a blanket. Blooming where you’re planted doesn’t mean that your entire life has to be an exercise in compromise. If you really want something. Like, really really want it -- expend the effort to make it happen. Identify one big goal and make action toward it -- in baby steps. I’m still working on this part, but I’m one of those people who gets a lot of happiness from planning and preparing for things. If I don’t grasp that ultimate goal, so be it. At least I’ll get close and gain a lot in the trying stage.